The thing that didn't sit well with the Ford design was clipping those metal clips to the hood despite the 3M clear tape. Lund use 4 screws which go into existing holes and sits away from the hood. Came with 4 clear bumpers to put on hood vs the black ones the Ford comes with. I opted not to install as it was pretty rigid felt it would not flex back to make contact. Will try and post pics after the next wash to get this nasty pollen off. Thanks for the info, I was going to go with WeatherTech but they don't make it yet or it's not available from their website. I like the way this looks and sounds Ez to install. got the authentic fomoco parts, looked at the poorly designed manual that came with it - the schematics aren't even the same thing as whats under my hood. anyone installed these yet - pics of the install to help out? thanks. 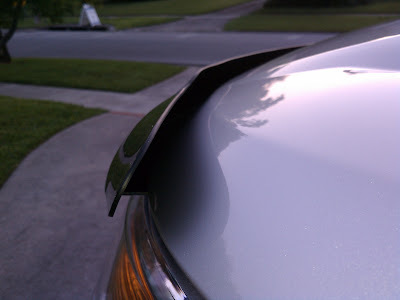 I pick up my hood deflector from Autozone tomorrow...hopefully I get the right one this time. Promise to post up pics. It's the same as what janskim has. It's actually made by Auto Vent Shade but they're apparently under the same ownership as Lund now. The have the kits for the 2011 Explorers. Cryptiq nice truck looks like mine I like the hood deflector over the clearmask. Had the film on for a week and took it off because did not like the line it showed. I want one! been holding out for one made by WeatherTech... was it Ez to install (I mean how many nuts, bolts, screws, tape was involved)? Looks Great! thanks for the pics. 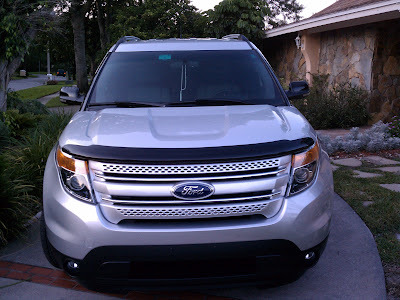 Just ordered and had the Ford hood deflector installed on my tuxedo black XLT. I hardly even notice it's there! Love the way it looks. I ordered that and the rear bumper protector through my dealer. They got them overnight and installed them the next day...no labor charge! Both look great. Hello, post a pic of the rear bumper protector! was thinking about this but I wanted to see one first. everytime i wax the vehicle then i have to remove 4 bolts all the time eh? no quick release system eh? No, it sits up off the hood to allow u to easily wash and wax. I tried taking a picture of it, but black on black makes it hard to show up. Here's a stock picture of it. It looks exactly like this one. 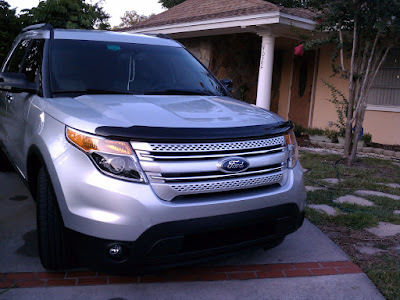 I'll post a picture of the rear bumper protector later today, I have one on my silver Explorer, so it will show up well. 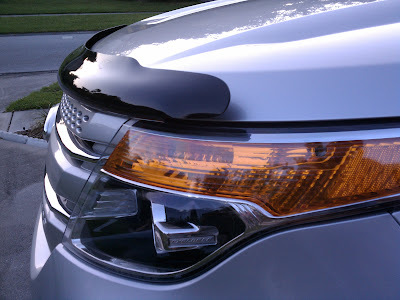 It's an easy install as they have paper that lines up with the bumper and curves of the back of the Explorer so that the protector lines up perfectly on the bumper. It takes maybe 10-15 minutes to install. Wanted to give everyone a heads up, I don't recommend the AVS Bugflector II Part #25164. I opened my hood the other day and noticed the deflector has been making contact with my grill and has rubbed the paint off. I've sent Lund/AVS an email to advise them of the issue and I'll follow-up with this thread when I have an update. Checked mine and don't have the rubbing wear issue. Curious what Lund/AVS says. I think also the inconsistancy with Ford fit on these body panels maybe playing a role. There have been many issues noted with door panels being off, tailgates not lining up your hood maybe tighter then mine hence the rubbing. I contacted customer service again because they never got back to me. This time they said I need to send them pics so their tech can look into the issue, and 3 estimates for the repair. Will follow-up once I get thru that process. I'm waiting for the Weathertech version as well and also the Window Vent Shades. I purchased 3 sets previously and I'm very satisfied.